My birthday is A MONTH away and so naturally I am already planning my raw wholesome sugar free cake which I plan on eating the whole thing. 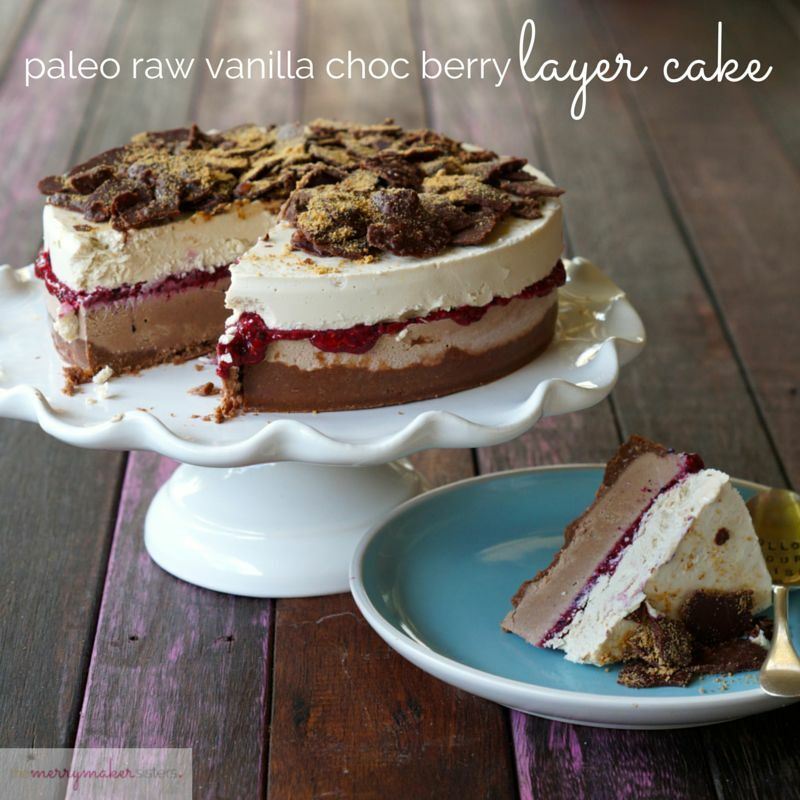 I came across this Vanilla Choc Berry layer cake and my mouth dropped. It is definitely in the running to be my 25th Birthday Cake! The Merrymaker Sisters >> Website HERE are two lovely local ladies from Canberra (yeah Canberra!!!) and are taking the Paleo life by storm. 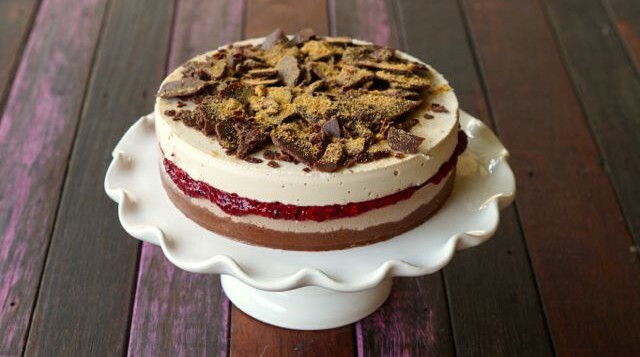 This layer cake is perfect for the gluten, dairy and sugar intolerant, is super healthy and looks amaze!!! Try it today! Start with the base. In a food processor (we use our Vitamix), place the walnuts, coconut, raw cacao powder and sugar substitute. Add the coconut oil and continue to whiz until the mixture becomes a smooth butter. Now to start with the chocolate layer. Drain and rinse the cashews and place them in to the food processor along with the coconut milk, coconut oil, sugar substitute, raw cacao and salt. Pour the chocolate layer mixture on top of the base and place back in to the freezer. Now for the berry filling! Rinse the food processor and add the raspberries, whiz until pureed. Add the chia seeds and whiz once again. Pour the berry filling on top of the chocolate layer and place in to the freezer. Rinse the food processor, now it’s time to start the vanilla layer! Drain and rinse the cashews and place them in to the food processor along with the coconut milk, coconut oil, sugar substitute, vanilla and salt. Whiz until completely smooth, this will take around 5 minutes (just like the chocolate layer!). Pour the vanilla layer mixture on top of the berry filling and place back in to the freezer for 2 hours. Meanwhile it’s time to make this cake EXTRA fancy with some chocolate shards! In a food processor, place the coconut oil, raw cacao powder, nut butter and sugar substitute and whiz until smooth and glossy. This will take around 5 minutes. Pour the chocolate on to the prepared baking tray and place in to the freezer for at least 10 minutes. Once set, break the chocolate in to shards. Place on to a cake stand, top with chocolate shards and sprinkle with coconut sugar! Cut in to slices with a hot knife and enjoy! 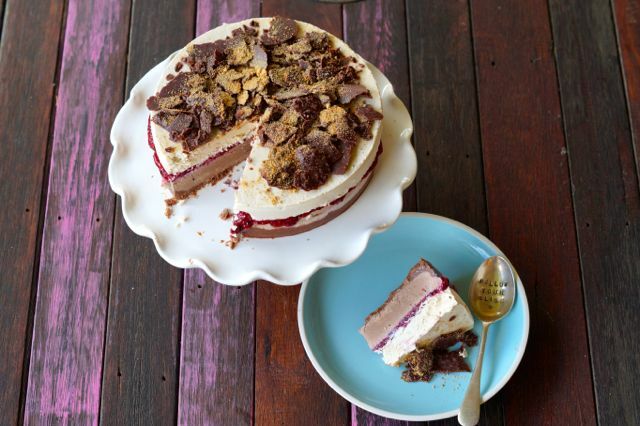 Store leftovers in the freezer and thaw out when you’re ready for a slice of epic raw cake! Now it might seem like there are A LOT of ingredients and Steps BUT HELLO that’s what makes it so darn delish and decadent!!! Worth every minute!!! Thanks Carla and Emma for a delish recipe !